Good early morning everyone! Today several of my Peachy Keen sisters and crafting friends are celebrating the union of Prince William and Kate Middleton with a royal blog hop! Check out these wonderful projects featuring weddings, prince/princess, fairy tale or love. The full blog hop list of participants are below the picture. For instructions on how to make my castle, please see the details below the hop list. How would you like to have a copy of my Fairytale Magic punch art class (details HERE)? Please sign up to follow me (if you haven't already) and leave a comment and I will randomly draw a winner on Sunday night. Please make sure you have an email on your profile or in your comment so I can contact you. Thanks and good luck! 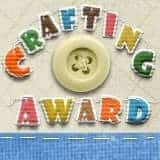 *all cardstock and punches used are Stampin' Up! Main back section pieces - 4-1/2" x 5", 4-3/4" x 1/2"
Front entrance section pieces - 3" x 2-1/2", 3" x 1/2"
Tower section pieces - (2) 1-1/2" x 4", (2) 1-3/4" x 1/2"
2) Punch out 18 Jewelry Tags from Crumb Cake card stock and cut off the small tops. Punch 3 Large Ovals in black and cut in half. Punch 1 Large Tag in black. Punch bottom center of the front entrance section with the Extra Large Tag punch. 3) Sponge edges of all crumb cake pieces with crumb cake ink. Glue jewelry tag pieces onto back of 1/2" wide castle pieces (7 on longest one, 5 on medium sized one and 3 on each small one). 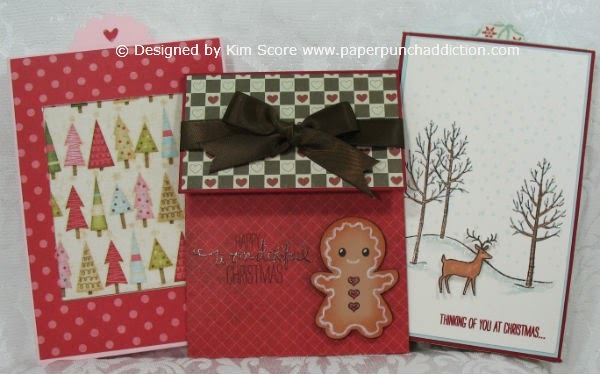 Emboss pieces with Bricked embossing folder (Tim Holtz) (optional if you have the folder). 4) Attach 1/2" wide pieces onto top of section pieces with dimensionals. Glue 1/2 black oval pieces on for windows. Attach front center section onto center of main back section with dimensionals. Glue large black tag into the doorway of front center section. 5) For roof, cut 4-1/2" x 3" in Pretty in Pink. On the back side of cardstock, draw a line from lower left and right corners to top center and cut off to create triangle. Cut a narrow triangle section in Bashful Blue for center. Cut a narrow strip of black for the pole at top. Punch smallest heart from Heart to Heart in real red. Stamp greeting from Occasional Quotes on white with regal rose ink. Hand cut banner and glue onto pole. 6) Punch 10 branches from 2-Step Bird in Wild Wasabi. Punch flowers from Itty Bitty Punch pack in Pretty in Pink, Marina Mist and So Saffron. Attach branches and flowers to towers and center section. Add pearl jewels onto center of each flower. 7) Die cut clouds using My Favorite Things Dynamics die. Attach Soft Sky cardstock to front of 8 x 10 gift bag. Add strip of wild wasabi cardstock along bottom of bag for grass. Attach main castle section with strong adhesive. Attach towers with dimensionals. Add glitter to edges of clouds and flowers. Tie pretty in pink grosgrain ribbon on bag handle. Lovely Kim, you did an awesome job on the castle! Love Kim. The castle is awesome. Very pretty gift bag!! TFS! Oh my good gravy, but this card is so lovely! I am a long time member of your blog - love coming here for punch art inspiration! Thanks for sharing this with us! What a wonderful castle! I love all the flowers across it! That castle is awesome! Love the colors and your creativity! Really cute! Oh my!! Kim, is there anything you can't figure out how to paper piece? Girl, this is just amazing!! I would never in a million years be able to have done this!! Your imagination is brilliant, and I thank you so much for sharing! Awesome!! That bag is beautiful. Too beautiful to put it to work! What an Adorable gift bag!! I LOVE the castle! Will definitely have to try this out!! New follower, looking forward to seeing all your creations! Thanks for sharing and thanks for the chance to win!! Stayed up into the wee morning to watch the royal wedding! What a cute bag! Wonderful job on the castle!!! Just love it! I love your castle. What a great idea for a gift bag. Your tutorials are great and I would love to win this. I am a follower. Love the detail! Very cute thanks for sharing! This LO is amazing! I love love love the colors and the flowers it just screams spring wedding! Thanks for telling us the detail to so we can go try it out, I think it is amazing! 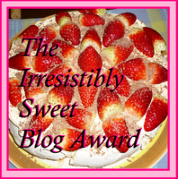 crossing my fingers for that blog candy too, how awesome! great gift bag! I love the castle and flowers. Oh,I just love this. This would be perfect for my little 4 year old Grand daughter. That is so adorable!! I just love your Castle!! Oh this is an awesome Castle gift bag for any princess lover! Thanks for the instructions and the chance to win a copy of the class! My little Niece Carly would love this! Cute gift bag. Im anew follower. What a cute castle! My niece would love it. Love the castle idea for a gift bag. My daughter loves princesses and castles every time she sees either she'll go nuts saying she wants it. TFS. What an awesome gift bag, I LOVE it, I watched the wedding and Kate's dress was absolutely georgous. Great idea to have a blog hop. If I won the class would I be able to follow it? I have been taught to scrap by a Creative Memories Consultant and I am just getting out of that kind of scrappin in the last year, it is all a little overwhelming! Eveyone on this Blog Hop seems so much more talented than I am! I absolutely love castles!! That is so FAB!! I love this! I cannot wait to try it! My grandaughter lives out of town and we don't get to see her often so I like to send her special cards and packages and this castle will be the next one! Oh wow - so beautiful and unique! This is so great...I love it :) I'm a new follower. Super cute bag!! Love it! Love your castle gift bag. As always your punch creations are awesome. TFS! You did it again!! 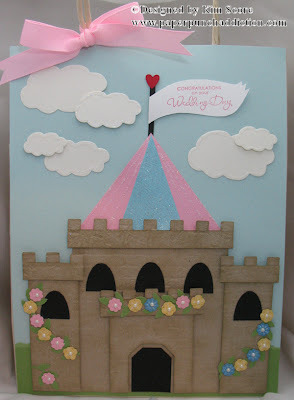 SOOO love the castle, with 3 little girls it will be a nice birthday card for one of them sooon!! Thanks for the directions..
Oh my you never dissapoint! I am always in AWE of how you do such AMAZING projects and they are all from punches! The details are just incredible! I love it! Thank You for the details of how you did this too! What a fabulous fairytale castle! Thanks for sharing the details! Already a follower and enjoy the gorgeousness I find here on a regular basis. Great Gift Bag. i love the floral garland and how it swags over the palace. Thank you for sharing your talent and providing inspiration! Great idea for a gift bag! Lots of fun details, like the flowers. What a great hop this is!! Love the castle, great job Kim. 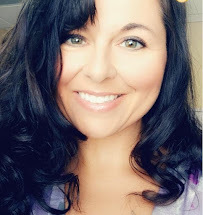 I am a new follower...looking forward to seeing all your work! TFS! What an awesome gift bag!! My girls would LOVE LOVE to receive a bag like this! You got the wheels turning... thanks for the inspiration. I just love this castle--so cute! Thank you so much for all of your sharing. I have a great niece turning 4 in a few weeks and she is very in to the Princess stuff..this will make a great bag for her - TFS!!!!!! You have selected perfect shades for this card that made it much attractive.